Now their site is down but I did pull this from the Internet Archive. Chinese Chess, or xiangqi, is an ancient game of intelligence. People often know some philosophy of life to raise their awareness of ability,thinking and have fun through a chess board.You can play against computer or a friend.All your family members can join in. The variations in the pieces, their movements, and the board layout make Chinese Chess Soul an exciting and challenging game.Now download Chinese Chess Soul and lead your army filled with Mandarins, Elephants, Horses, Chariots, Cannons, and Soldiers, fight, attack, and checkmate. 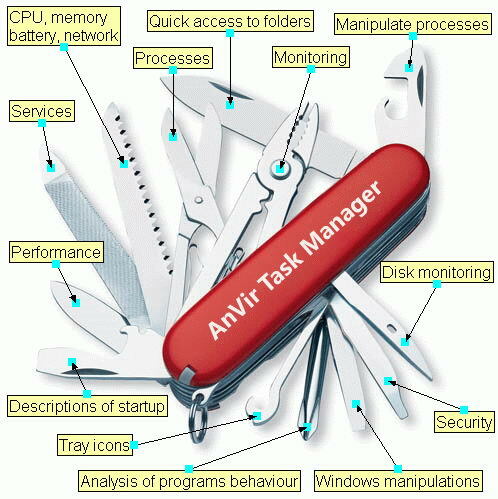 Anvir Task Manager isn’t your normal task manager. I use Anvir Task Manager to place programs on top when I’m researching. I also use it to make windows invisible and scare my friends when they suddenly see the half transparent screen. Aside from the fun stuff, you can monitor and view heat, CPU, RAM and DISK (and battery if you are running a laptop). You can also quickly open past folders by right clicking the tray icon. Its startup options include delaying the startup so your programs boot faster. You can also delete nagging processes. All that is for free today when clicking the link below.